You meet them every where. The ones with the battle scars. From a relationship gone wrong, a job lost and never regained, the death of a beloved, those traumatic childhood memories that never seem to go away. The causes are many and varied. Some wear these scars with pride. Like medals of honour. Some carry them like a yoke, shoulders heavy with the burden, unable or unwilling to be consoled. Still some others bear them like a coat of armour. Steeled against pain, even against joy. Unforgiving. The deepest cuts are the ones made by the people on whom one has invested a lot of time and caring on. 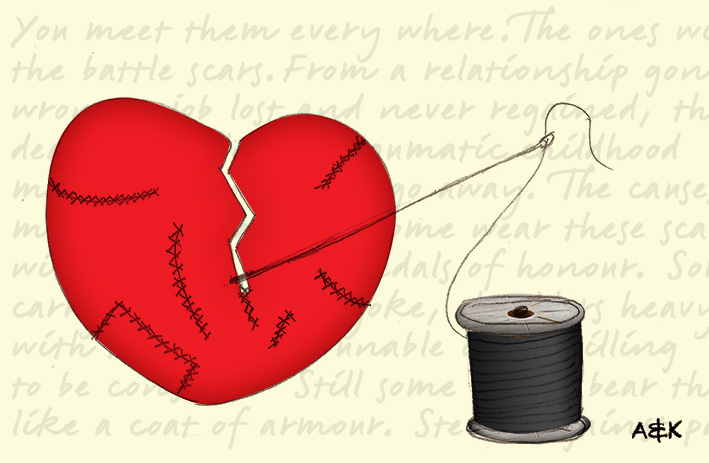 Childhood friends, colleagues at work, acquaintances made through the course of living, family… wounds of the heart. I know I am one of the battle scarred. I like to think that I wear the lesions with dignity and pride. Grateful not only for having survived but also for the lessons each of those experiences have taught me. Each of us carries a mended heart. My heart has been broken and mended so many times, I wonder if it can take any more. But it can. For in my world, there is nothing perfect. Certainly not me. In my world, there is very good, good, ok, so-so, just about right and lots of try-again-next-time. Perfection like Never-land is so confining. When there is no room for error, where can one go? I am certain that along the road of my nearly 64 years, I too have caused pain to some one else. I know that I would never do this on purpose. But it happens in spite of my ever-guilty Catholic heart and years of trying to be the “good girl”. With love. Of one’s self, helped along with the love of the people who matter most. I like to think that my battle-scarred heart lives on because I have not given up. I still open myself to new experiences and friendships, while I allow the old ones to mature and become part of who I am. Imperfect. Yet not impenetrable. Here's a hearty meal for a family dinner which can be doubled and tripled for a big Sunday lunch or a festive buffet! Saute the onions in butter till soft. Stir in the chicken. Pour in 1 cup salsa. Mix well. Add the cream cheese and cumin. Season with more salt or chili powder according to your taste. Remove from heat and add ½ cup grated cheese. Set aside about a cup of chicken mixture. In a separate pan, heat the tortillas till they are soft. Butter or oil the bottom of an oven-proof dish. Place about 3 tbsps chicken mix in each tortilla and roll. Lay them in the baking dish and cover with the following topping. Mix and heat through : 1 cup chicken-cream mixture, salsa, cream cheese, and water or chicken broth. Add more water or broth if the mixture is too thick. Taste and add salt or spices according to your taste. Pour over the tortillas. Sprinkle cheese generously on top and bake for about 30 minutes in 200 C/350 F or until golden brown. Serve with a salad and a cold beer or a glass of wine! This can be made a day ahead and baked just before serving or it can be frozen and baked when needed. my dear val, yes.. scars do heal. even the ones in our hearts.